Mandarin Characters Lesson - Long Time No See! Chinese Video Courses >> Beginner Chinese Series 4 >> Long Time No See! Lesson 1 How about going to the bar? Lesson 2 Let's take some photos! Lesson 3 I'd also like to try Beijing's local snacks. Lesson 4 Wow! Shao Mai is really delicious! Lesson 5 I want to buy a gift for my girlfriend. Lesson 6 Long Time No See! Lesson 7 You Have a Cat? Lesson 8 Do you want them washed or...? Lesson 10 What would you like to drink? Introduction: Learn useful Mandarin characters and grammar to express that an action has occurred. hǎojiǔ bújiàn Long time no see. particle le Indicating that an event has already occurred. adv. méiyǒu An action didn’t happen or hasn’t happened. We use “了” to indicate an event has already occurred. The Oriental Pearl Tower gets its name from the poem by poet Bai Juyi's "琵琶行Song Of A Pipa Player": "大珠小珠落盘"; played with a mingling of loud and soft notes, it was as if large and small pearls were dropping on a plate of jade. The imaginative designer of the Oritental Pearl Tower created this beautiful picture by combining 11 balls of different sizes falling from the blue sky onto the green grassland below. 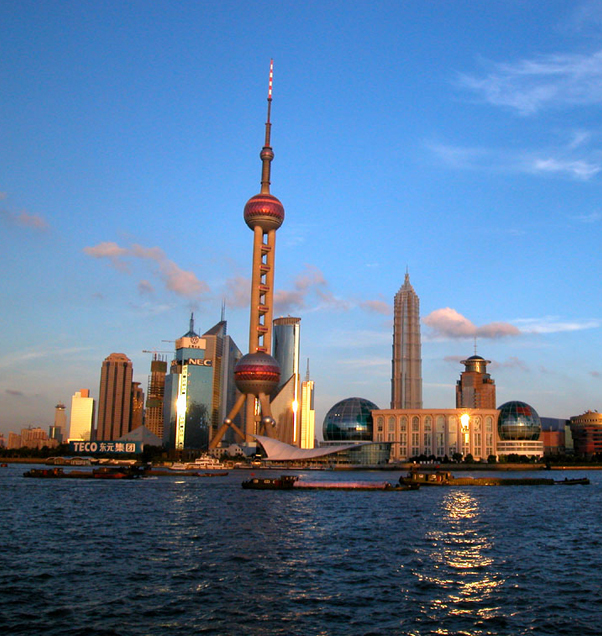 Located at the lobby of the Oriental Pearl Tower is "Shanghai's Urban Development History Museum". It is more than worth a visit. You can find traces of old Shanghai, and a condensed version of almost one hundred years of the city's history since the opening of its ports. In this Mandarin lesson, we will learn popular Mandarin expressions such as long time no see, of course, and more. We will also learn about places of interest in Shanghai: the Oriental Pearl Tower, the Museum of Shanghai, etc. How much 20 lessons online cost. I’m Lisa, a member of eChineseOnline’s customer support team. You only have to sign up for your 7-day free trial and then you will gain FREE access to ALL of our Chinese courses for 7 days. If you would like to learn the Chinese language systematically, we suggest taking Chinese Pinyin first and then the Beginner Chinese Series. If you just want to learn some basic Chinese words and expressions, you can start with Survival Chinese first. Ni hao. What can I do for you? No, thank you, just saying hello, I enjoy your video.